Total Workshop search results: 49. Displaying Page 1 of your woodworking search phrase DINING CHAIR PLAN. One or more of these Mission style end tables would look great indoors or outdoors.A perfect compliment to our Mission style Dining Chair 05-WC-0945 and/or our Mission Style Dining Table 05-WC-0943. Complete mortise and tenon construction but you could use screws instead. Use whatever wood material your budget will allow, best built using a hardwood. Our Mission style chair with its gentle sweep of the legs make it a beautiful design. Complete mortise and tenon construction but you could use screws instead. Match it with our Mission style Dining Table 05-WC-0943. Build as many chairs as you need. Use whatever wood material your budget will allow, best built using a hardwood. Also consider building the chair using woods that are rot resistant and make yourself a beautiful patio set. The plan says: You will have fun building these well designed chairs. The enclosed pattern provides complete directions for making both an adult as well as child size chair. It also provides patterns for building the chairs with or without arms. If used as a dining room set, stain or finish natural. Paint or enamel for use out-of-doors. The plan says: This pony step stool helps youngsters in many ways. 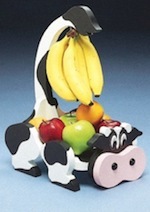 Place it on a chair to raise him to proper height at the dining table or let him stand on it when washing his hands. Small fry like riding this pony to dinner. Its easy to build and decorate. Trace pattern on wood, saw or paint to traced outlines. Our Mission style table with its gentle sweep of the legs make it a beautiful design. Complete mortise and tenon construction but you could use screws instead. Match it with our Mission style Dining Room Chair 05-WC-0942 and Mission style Bench 05-WC-0945. Use whatever wood material your budget will allow, best built using a hardwood. Also consider building the chair using woods that are rot resistant and make yourself a beautiful patio set. A project that is pretty enough to be by itself. Yet our Mission style bench is a perfect compliment to our Mission style Dining Chair 05-WC-0945 and/or our Mission Style Dining Table 05-WC-0943. Complete mortise and tenon construction but you could use screws instead. Use whatever wood material your budget will allow. Also consider building the bench using woods that are rot resistant for outdoor furniture. Build an outdoor dining table and chairs from pallets using these step-by-step instructions. 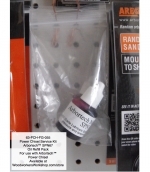 Link Type: free plans | Link Source: Brit | Visit the category | Fix Link? 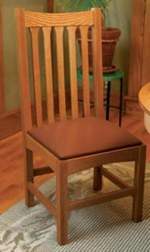 Take these free woodworking plans and build this dining chair. Great step-by-step instructions and illustrations. Follow these step-by-step instructions to build this chair. A link is provided on the upholstering too. This awesome bench is a great diy project. 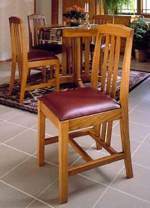 Here are the free woodworking plans to built the three chairs and the seat. This outdoor patio chair was designed for a 21 x 21 x 4 inch cushion. These dining chairs feature a floating seat and solid back. Here are the step-by-step instructions to build a set. Free step-by-step instructions to build this chair including tips on upholstering it.